It's the fifth and final day of Sony's countdown to its big E3 showcase on Monday, and the last reveal is the arrival of Beat Saber on PlayStation VR, having previously been available on the Oculus Rift and HTC Vive. 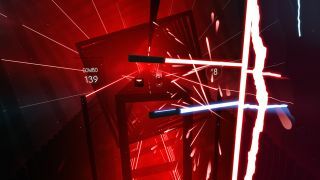 If you're not already familiar with Beat Saber, imagine being a Jedi knight traveling through a Tron-style corridor wielding a couple of lightsabers. Your task is to cut down the glowing neon blocks as they zoom towards you – it's a bit like Guitar Hero with VR swords instead of guitars. "Beat Saber is a VR rhythm game, where your goal is to slash the beats which fit perfectly into precisely handcrafted music," runs the official spiel, and if those descriptions aren't enough for you, you can check out the trailer below. As yet we don't have an official release date or price for Beat Saber for PS VR, but the game is confirmed as coming to the platform, so you shouldn't have too long to wait before the title is available to buy. Even if the game doesn't seem like something you'd ordinarily get into, it is extremely well reviewed by the people who've actually played it, so it might be worth giving it a chance – the Steam version allows custom levels as well as levels designed by the developers, so there's plenty of variety included. And that concludes Sony's countdown to its E3 press conference on June 11 at 6pm PT/9pm ET/midnight June 12 BST. The Beat Saber announcement adds to the news we've already had about Ghost Giant, Twin Mirror, Days Gone and Tetris Effect.